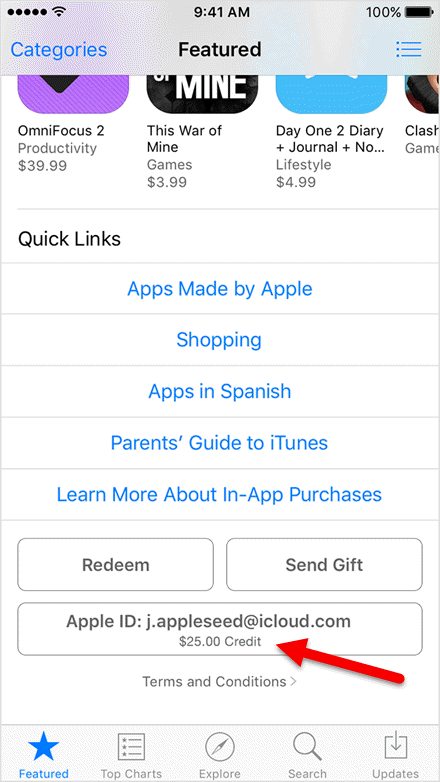 If you have received an iTunes Gift card, your Apple ID will have a credit balance attached to it. But how do you know if the gift has been correctly received and added to your account. Here are some of the ways in which you can check your Apple ID balance. 1. Open the iTunes Store, App Store or iBooks app. (For the purpose of this tutorial. I’ll open the App Store on my iPhone running 9.3.2. You will see a number of options such as Quick Links, Redeem, and Send Gift along with your Apple ID and the Apple ID balance right under the Apple ID email. If you’re not signed in, you’ll need to tap the Sign In button and enter your Apple ID and password to see the balance. 2. Tap your Apple ID. You should now see your balance listed under your Apple email address. If you don’t have any credit balance in your account, you will not see any balance or amount under the Apple ID. 1. Open iTunes, sign in with your Apple ID and click on the iTunes Store. 2. At the top right-hand side you’ll see your balance. Again, if you do not have any credit to your account you won’t see an amount listed. 1. Open the Mac App Store and look for the Quick Links on the right-hand side. If you’re not signed into your Apple ID account, you’ll need to do it in order to view your balance. These are the simple ways in which you can check your Apple ID balance from your iOS device and PC. For more iOS tips, check out our archives center.